Names like American Thunder Ride Truck, Monkey' n Around, RAMinator, Bigfoot, Public Disturbance, and Monster Moose will be on everyone's lips once they see this impressive Monster Truck bounce house. With more than 250 square feet of bouncing fun, participants can jump the day away. Perfect for a truck or sporting event or any activity where bigger is better. **360-degree mesh windows, so parents and spectators can have a clear view of all the fun. **Made safe and secure with lite n strong , fire-resistant vinyl making it safer, portable and more durable. 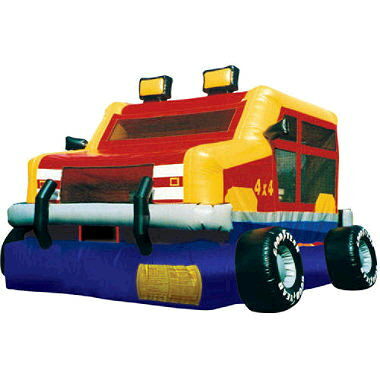 * Please call us for any questions on our monster truck bouncer rentals in Rocky Mount and Wilson NC.